Hamid Ismailov had a standing-room only crowd at Waterstones Piccadilly, “Europe’s Largest Bookshop,” for the launch of his novel The Underground. Ismailov was joined in conversation by the book's translator, Carol Ermakova, and Hugh Barnes, a journalist and specialist on Russian matters. Read all about it on the Turnaround Blog. THE GUARDIAN: "A LUMINOUS ELEGY FOR LATE-SOVIET MOSCOW"
"What I lacked as a reader and writer in the Soviet era, from childhood onwards, was a depiction of the reality that was around me. I was in a melting pot of all kinds of nations, cultures, beliefs, faiths and civilizations, and I didn’t see the richness of these experiences depicted in Soviet literature.... In coming to the west I all of sudden realized it was an even bigger problem for western literature than for Soviet. In Ian McEwan’s famous books you hardly meet any Black people, or Caribbean people, or Chinese. Take wonderful Kazuo Ishiguro, who is himself Japanese by origin. Almost all his books are about English people, and that’s it. So in the mainstream English literature you can’t see any multi-national, or other realities apart from rare exceptions." For media and publicity requests, contact Nathan Rostron. Although his work remains banned in Uzbekistan, Ismailov has found audiences all over the world, and has published not only in Uzbek and Russian but also in English, French, German, Turkish, and other languages. The Railway, a masterful novel Ismailov composed before his forced emigration, is out this month from Restless Books. In this latest installment of Restless Books' Authors Around the World interview series, Ismailov speaks with us about the habits of the itinerant writer, the “island mentality” of a landlocked nation, and the Uzbek roots of The Arabian Nights. 1. Describe your preferred writing spaces, whether that’s when you’re in London or when you lived in Uzbekistan or the places you lived in between. My writing space moves with me. One part of me comes from a nomadic background when you mount on the horse whatever you need for your survival. So all I need is a square meter and a pen and paper (or any replacement for them, like a Blackberry). All my life I write not because of a certain circumstances, but despite them. 2. As a writer, what’s the most inspiring thing to you about Uzbekistan? About England? In both cases the language and people, their literature and history, then the geography. Brits and Uzbeks (and also possibly Japanese) are strangely similar in their makeup. The British and Japanese “island mentality” is quite widely researched and described. Less known is the Uzbek “island” mentality in the very middle of the Eurasian continent. The country is locked from all sides either by impassable steppes or deserts or the steep walls of mountains. 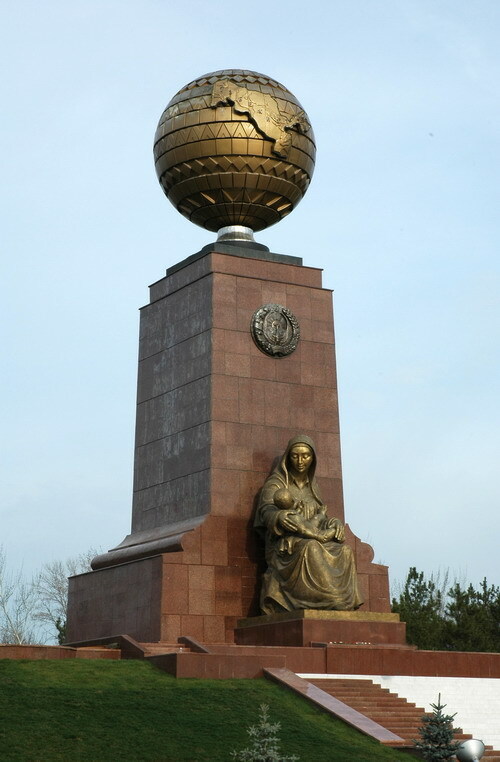 Those who have been to Uzbekistan might remember the main monument on the central square of the capital—a globe with one country on it. Guess which country? So bringing everything together, maybe deciphering these mentalities is the most inspiring thing for me. 3. What aspect of living in Uzbekistan is most difficult to convey to people from elsewhere? The fact that you are living not in real life, but rather in a Kafka novel, and yet you consider and sometime shout that you are living real life. 4. What’s the first book you would recommend to a visitor to Uzbekistan who wants to understand the place? The Railway for the background and A Poet and Bin Laden for the latest. It’s not an advertisement for my own books, but rather practical and pragmatic advice. Unfortunately there are no translated books, unless you read Russian. But even so, I’d recommend the same books. 5. What is your favorite idiom in Uzbek or Russian? Too many to mention. I’m not a monophiliac person, who can easily choose his favorite this and that. What I love is interaction between this and that, be it colors, words, idioms, nations, civilizations, etc. There’s a famous tongue-in-cheek saying in Uzbek: “What’s the point in the greatness of the world if you have narrow shoes?” So my take is the opposite: “What’s the point of putting on narrow shoes if the world is so great?” So both literally and figuratively I love to walk barefoot. 6. What’s the literary culture like in Uzbekistan? Who are its literary icons, past and present? Not many people pay attention that the narrator of One Thousand and One Nights. Scheherazade and her listener King Shahriyor are situated in Samarkand, one of the cities of modern Uzbekistan. So that is the land glorified by the biggest of lived poets and storytellers. I'll give Samarkand and Bukhara, for her Hindu beauty mole. 7. What do most Americans misunderstand about Uzbekistan? What do most Uzbeks misunderstand about America? I guess that common people look at the geography and the size of the country and put this or that country accordingly in their mental charts. I’m sure that Uzbekistan is pretty low in those people’s tables. What they might not know, the fact that every nation and ethnicity in the world considers itself as the focal point of the universe. Mind also that the Uzbek and British ran empires much bigger by territory than the contemporary United States! But that might be my—an Uzbek’s—misunderstanding about America. 8. What do you think the leader of Uzbekistan reads? I know for a fact that he reads the briefings prepared for him by the National Security Service on what is said about him in the foreign press; he reads speeches prepared for him by his speechwriters, some of whom luckily are or were good writers. I guess he read some Russian novels when he was young, but I can’t imagine that he read, reads, or will be reading any Uzbek fiction. 9. What’s an apt metaphor for being a writer in Uzbekistan? Die before your death, or even better: die before you were born, with a disclaimer, that it’s my take. Others might have different views, especially if they still live in Uzbekistan.